Angered by a "guilty" verdict issued Saturday against their MP, residents of Qalioubiya demonstrated in front of the court, blocking the entrance. 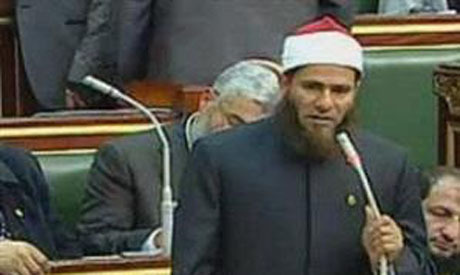 The Egyptian Salafist politician, Ali Wanis, was found guilty by a court in the Delta town of performing an "indecent" sexual act in public, receiving a one-year suspended sentence after paying a fine of LE1,000 ($165). The demonstrators accused the interior ministry and police of setting MP Wanis up in order to taint the image of Islamists. For decades police were instructed by the Mubarak regime to harshly keep Islamists in check. "Wanis carries God's book and will never upset God" were amongst the banners the protesters held in front of court in his defence. Ali Wanis, a member of the Salafist Nour Party in Egypt's dissolved Parliament, was arrested in early June when police discovered him engaging in a sexual act with a 22-year-old woman in a car parked on a coastal highway. The female university student arrested with Wanis was given a six-month suspended sentence and fined LE500 ($82). The court also found Wanis guilty of assaulting a police officer during his arrest, handing him a further six-month suspended sentence and a LE500 fine. After the June incident, Wanis denied any wrongdoing and said in a video posted on his website that he had parked along the side of the road because his passenger "became sick." The demonstrators left the court building only after they were informed their MP would give a speech back in their village. The Nour Party, which represents an ultra-conservative and puritan brand of Islam, won the second largest number of seats in parliamentary elections last winter after the Muslim Brotherhood. The parliament is now dissolved because of a court ruling deeming it unconstitutional. The same Salafist party was hit by scandal earlier in March when another lawmaker was forced to resign from parliament and the party after claiming he was injured in a carjacking. It was eventually revealed that the bandages he placed on his face were due to a surgical nose job. He carries God's book and will never upset God. This is a great statement, if they do what they say and say what they do. Sexual indecency from a man who carries God’s book and cheating of surgical nose job by a lawmaker are the kind of scandals that an ultra-conservative party cannot afford. It is imperative to work against this false “wisdom of crowds” under the flag of our religion for a better future of the country..